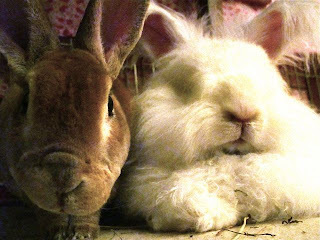 potentially nervous: not just two bunnies! kiss a smushy bunny face and then kiss the next smushy bunny face. oooohhhh how I love dem faces! Bells looks made out of velvet in this pic. D moll: you're going to have to do the calculations and get back to me, i'm sure the formula for the equation of bells and nuage is in that big brain of yours somewhere. come on, if you start with the theory of relativity i think and work towards complexity you'll be heading in the right direction. shell: talk about smushy smushy faces!! kiss your too! bunnygirl: bells feels like he is made out of velvet as well. maybe it's just a rex thing, but everyone always ooohs and aaahhs over how soft the angoras are, but then they pet bells and it's a whole 'nother ball game. even fats and nuage are completely different in their coats' texture. OMG ~ you MUST come over to my blog today and see the pic I posted of my 2 buns... a slight variation of your first pic...wow!